The human papilloma virus causes most cervical cancers. That's why HPV testing is now recommended for women ages 30 to 65. For decades the annual Pap test was women's chief protection against cervical cancer. 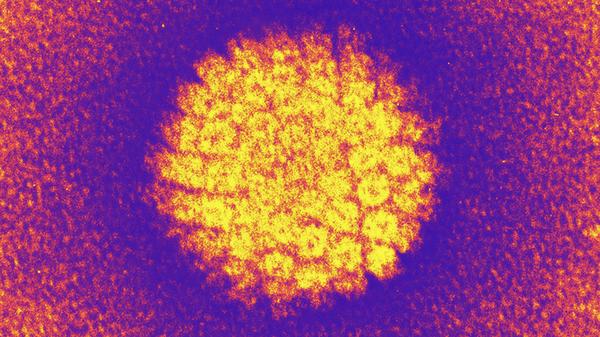 That all changed when a test for human papillomavirus, the cause of most cervical cancer, was approved in 2003. With the HPV test, women don't need to get Pap tests as often. But that message hasn't gotten through to many doctors. Just 39 percent of clinicians ordered HPV tests for women when they went in for a checkup in five Michigan clinics, researchers found. Other doctors were ordering the HPV test too often. Many still performed annual Pap tests even though women can wait for five years if they tested free of HPV. And some doctors were prescribing annual Pap tests and HPV tests. "That is really excessive," says Dr. Mack Ruffin, a cancer prevention researcher at the University of Michigan. He is a coauthor of the report, which was published Thursday in the Journal of the American Board of Family Medicine. Most people are infected with HPV at some point in their lives; it's sexually transmitted. In most cases our bodies clear the virus, but some women can have infections that linger for years. That puts them at much higher risk of cervical cancer. The Pap test looks for precancerous cells on the cervix, and is recommended for women starting at age 21, according to the Centers for Disease Control and Prevention. But the Pap returns a lot of false positives; a simple bacterial infection can make cells look abnormal. So women with an abnormal Pap have to go through a lot of retesting, and anxiety over whether they might have cancer, before finding out they're fine. Adding in the HPV test to cervical cancer screening helps reduce the number of false positives. If a woman over age 30 tests negative for HPV, she's much less likely to be diagnosed with cervical cancer. So she can wait five years until the next round of combined HPV and Pap testing, according to the American College of Obstetricians and Gynecologists and other groups. That saves time, money and the risks of false positives. Sounds good. But is it working? Sort of. This study looked at the experiences of 833 women between the ages of 30 and 65 who went to five Michigan family medicine clinics from 2008 to 2011. The good news is that the clinicians' requests for HPV tests increased over time, going up 46 percent. They were getting the message about the new protocol. But the fact that less than half of clinicians were ordering HPV tests suggests that either word hasn't gotten out, or it's gotten garbled. Others ordered that women repeat both the Pap and HPV test annually. Pap tests are currently recommended every three years for women in their 20s. Women ages 30 and above who don't do the HPV/Pap combo should get a Pap test every three years, too, according to the guidelines. Mack and his colleagues figured that the younger clinicians would be better at this, since they wouldn't be stuck in their ways. But they were wrong. Older and younger clinicians were equally indifferent when it came to ordering HPV tests. The real stars of the show were women. Female doctors were twice as likely as their male peers to properly prescribe the HPV test. Female physicians may just be paying more attention to women's health issues, Ruffin says. Or they may be better at discussing a sensitive issue like testing for a sexually transmitted virus. "They may be more aware, more attuned," he tells Shots. Ruffin doesn't blame his fellow doctors for doing a less than stellar job at cervical cancer screening. "We're in transition," he says. "This is just one step." Five years from now, he says, we might be talking about women being able to do HPV tests at home, popping a swab in an envelope and mailing in their results. That method is already being explored in other countries, and may someday be expanded to include tests for other common STDs, such as chlamydia or gonorrhea. Ruffin says: "The best way to screen for cervical cancer is really going to change."